About Flickr: around the edges of my day I learned few new things in regards to Flickr…first, and most drawn out was figuring out how to create a “friendly” URL for my flickr account. And, get this–you only get one try at it! If you don’t get it right the first time, apparently you’re stuck with a URL something like “…/photos/50049440343@NGzz4O” and who wants that? I learned how to email images into my Flickr account, also. 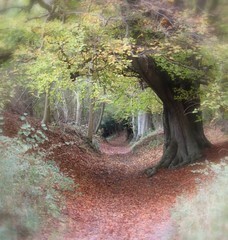 And…I set myself up to be able to send images from Flickr directly into my blog…so hear goes this wonderful image of an autumn pathway I found on Flickr onto my blog…Thanks to “Onecurlycat” for making this a public image! It’s really mesmerizing. That is a beautiful photo! Doesn’t it just make you want to step into it?